Open interior, with an abundance of natural light, giving a feeling of space. Standing height 1,95 m in the salon. 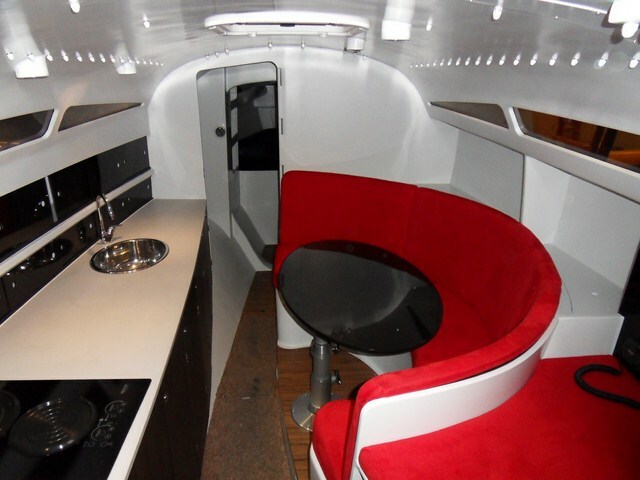 ‘Custom built’ galley, finished with sporty accents. Sliding doors above the galley, dining table and chart table are made of clear coated carbon. The daggerboards are in the floats, so not in the way. 5 comfortable sleeping places (2×2 + 1). Click here for a 3D-visualisation of the interior.